6cm is a bit of a bodge!! I found that there are commercial WiFi to WiMAX converters. Stick 2.4 GHz WiFi in and get 5.7 GHz WiMAX out. So I found one on Ebay being sold by Art-in-Part. This was more of an industrial beast then others I have seen and worked a treat! 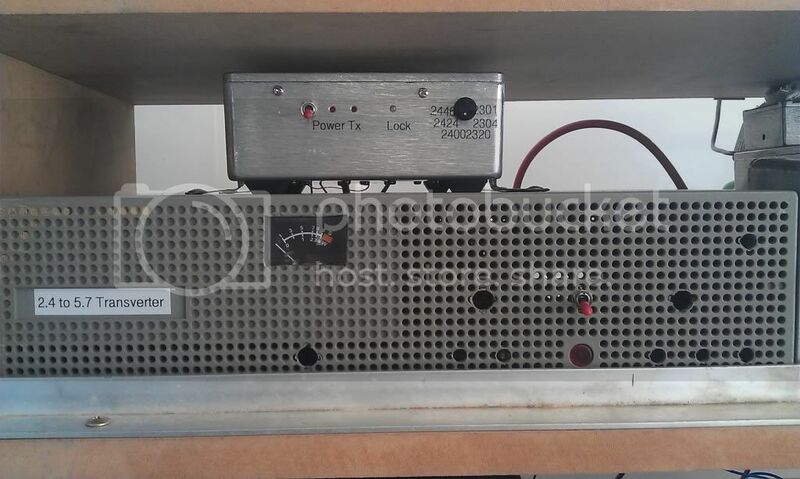 It was compared to a DEMI 6cm transverter and preformed quite well against it. Needs to be mounted on a good heatsink as this feaster gets hot! It has 2 converters inside it running off the one LO. And since it “thinks” it is transmitting on 2.4 GHz and 5.6 GHz all the time it gets very hot. The LO is a built around the well know Qualcomm Q3236I PLL chip and there is a weath of information around on understanding these. But this one couldn’t been easier! I just “sniffed” the LO on my spectrum analyzer and fiddled with the DIP switches till I had it tuned on 3.27 GHz, done. And since these looked to have been pulled from a telephone exchange somewhere they were made to run on 48V. I just pulled the large DC-DC inverters out and replaced them with a 5V and 12V regulators. You can see where the DC-DC inverters where on the PCB. All I needed was an amplifier and 2 SMA relays, stick my 13cm transverter into it and I was away. So I use my Kuhne 13cm transverter on low power on 2.400 GHz which gives me 5.670 GHz out. 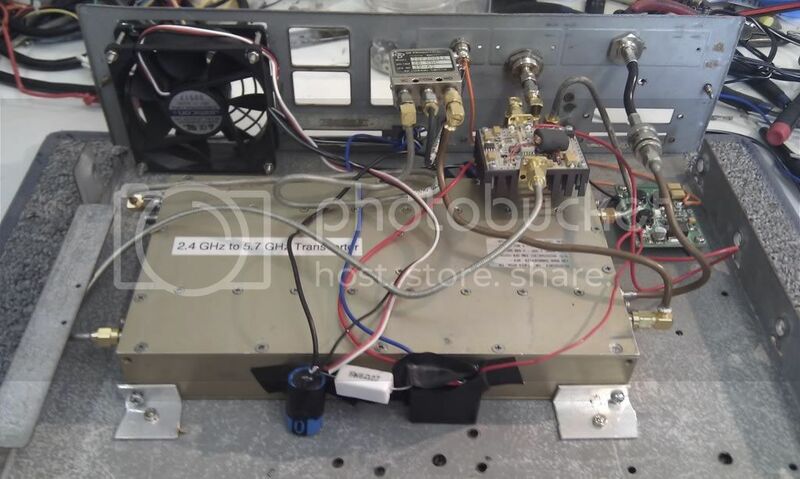 The Amp is a VK5EME 1W model and I also have a 6W Terrasat that needs some work to get on the band. I’d like to have a go at EME on 6cm but I will need a better transveter and pre-amps. For my portable setupI have a WiMax dish feed I picked up on ebay (Art-in-part again). Which I can use on both my 1.2m and 60cm prime focas dishes. At 50% the 1.2m dish has a huge 35dBi of gain. With my 1W I am getting about 3.1KW ERPi. But a dish that size is very very “pointy” at these frequencies. My best distance is with VK5DK/P at 209 KM.